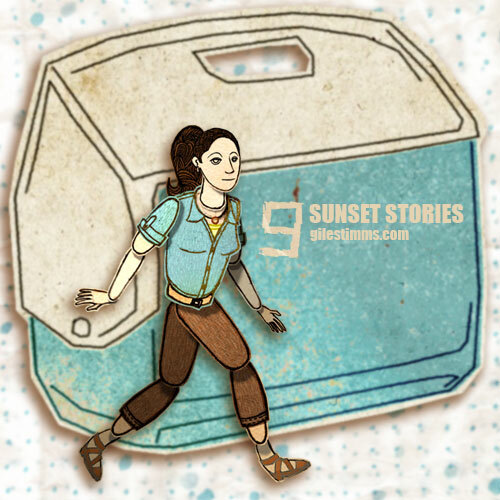 Sunset Stories is a refreshing mix of several different genres of film, which manages to encapsulate bits of everything, without ever becoming too much of one thing. It’s first and foremost a comedy (a dark comedy, given the subject matter), but it’s evident from the very start that it’s also full of heart. There’s some romance, to be sure, but not enough to tip it into the generic rom-com category. And the sheer number of different characters we meet along the way – as well as how the story points all fall apart and come together in the end – may make it seem to be more of a dramatic tale at times. But it’s none of those things, and all of those things, all at once. The film follows the adventures of May (Monique Gabriela Curnen), a nurse working with young cancer patients in a Boston hospital. When one of her charges expresses dissatisfaction with the reading of a generic fairytale before bed one night, May launches instead into a version of her own story, and what happened to her during her most recent quest. Her supervisor, Pam (Meredith Scott Lynn), sends her to Los Angeles to retrieve a cooler of bone marrow needed for a critical transplant, and bring it back to Boston in time to perform the procdure, and before the delicate material can become damaged and expire. At first, everything goes smoothly, but before she knows it, May’s present has collided head-on with her past in a chance encounter with JP (Sung Kang), the man she’d left without warning five years ago. Flustered, May promptly loses the cooler of bone marrow, and suddenly finds herself paired with JP once again, this time as they run all over the city trying to track the cooler down within the 24 hours they have left. What follows has been described by co-director Ernesto Foronda as “a love letter to Los Angeles”, as the city streets and vistas provide an ever-changing and character-filled backdrop to May and JP’s frantic seach, as well as to the plight of the bright blue cooler itself. Throughout it all, May flashes back to her relationship with JP, and the pair start trying to delve into why their relationship failed in the first place, all while trying to track down the elusive bone marrow cooler. Their search takes them physically from one side of the city to the other, and emotionally neither one is the same person by the end as they were at the start. The cast of characters is absolutely astounding, and could have made Sunset Stories one of my favourites all on its own. But the sprawling city of Los Angeles is almost a character unto itself, and getting to experience all sides of it – from famous sights like the Walk of Fame to little unknown restaurants tucked away in favourite corners only the locals know about. Several familiar faces jump out at the viewer as the film progresses, but much of the film’s success resides in the great on-screen chemistry evident between Curnen and Kang. The secondary characters are all perfect in their roles, and serve to provide much of both the comedy and heart of the film (a few of them even moved me to tears, at times), but as the deadline for the bone marrow draws closer, one suddenly realizes that this search has been about more than just the one thing. As a viewer, I was suddenly not only wanting May and JP to find the cooler and get it to Boston in time, but I was also rooting for May and JP to figure things out between them, as well. Like the city of Los Angeles itself, this film is many different things at once – some large arcs that take over everything, and some small, individual stories that show how life can sometimes shape who we are. It starts out as a search for a cooler, but grows into a search for so much more. Sunset Stories is screening as part of the ReelWorld Film Festival on Saturday April 13, 2013 at 4:00pm at Canada Square. Tickets are on sale now! For more information, check out the official film site here.